DRIVING ON FREEWAYS WITH HYPNOSIS!!! You may be surprised to hear that fear of driving on Freeways is a fairly common phobia. Many people develop anxiety around driving on highways, over bridges, or just being in a car in general. You may find that you have become hyper-alert when in a car, to the extent that it actually makes driving more difficult. Because driving is essentially an unconscious activity (you don't think about shifting gear, or pressing the brake), too much anxiety can interfere with the smooth operation of the car. When this happens, people often start to doubt their ability to drive, further increasing anxiety levels. My Overcome Fear of Driving on Freeways Hypnosis CD or Overcome Fear of Driving on Freeways hypnosis MP3 will help retrain your mind to relax when at the wheel while retaining a safe level of focus. You are a much safer driver when you are relaxed than when you are stressed, as you probably know. PLEASE: Do not listen to this download in your car! finally overcome your fear of driving on freeways!!! Hypnosis is the answer to overcoming the fear of driving on freeways. The general consensus among health care professionals, psychiatrists, hypnotherapists is that the fear of driving on freeways and most other fears for that matter can be overcome by learning to deal with them head on. In order to face and confront the fear, a level of relaxation needs to be achieved. This is best achieved through hypnosis. It is a prescription free way to take control of your life and overcome your fears. Hypnosis is effective in overcoming driving related fears. However, this is one situation where you wouldn’t want to practice the hypnotic behavior while doing the task. The preparation needs to come prior to driving and then the feeling is carried over while heading for the freeway. This is because in order for hypnosis to work, you need to become completely relaxed. This level of relaxation behind the wheel would be dangerous to yourself and others on the road. Ideally, hypnosis to overcome the fear of driving on freeways should be done at home. Right before going to sleep at night is often the best time to reach the level of relaxation required for hypnosis to be the most effective. Once completely relaxed, then hypnosis is able to create a new way of thinking about your fears. 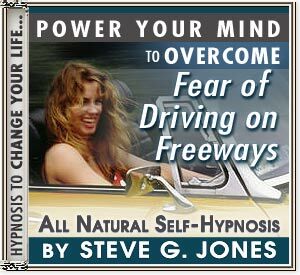 Steve G. Jones created a self hypnosis program called “Overcoming the Fear of Driving on Freeways.” As a clinical hypnotherapist, Jones is able to create a calm feeling when entering the freeway. It is learned and developed prior to facing the experience and then carried through while driving.